It’s almost impossible to do things on a vacation that everyone’s excited about. It’s the nature of families. Not everyone’s keen on spending 4 hours in a plane museum, going to get your toes painted all pretty-like, looking for the perfect Nerf gun at Toys R Us, or have a farting contest. So, like the UN, we compromise and we do stuff that others want to do. 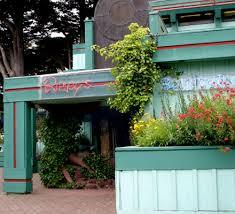 Like going to Ripley’s Believe It or Not museum in Newport, Oregon. Now here’s the thing. The Oldest has every Ripley’s book ever written. I think he’s even got an app that will report all the latest believe-it-or-not news. If there was a video game, he’d probably own it. So going there was a huge ‘want’ for him. And if The Oldest wants to do it, then the Youngest does too. Like currently The Oldest is going through a voice change. So, naturally, the Youngest, age 8, believes his voice is changing, too. And he’s pretty sure he’s getting a mustache. So, anyway, both boys were keen. They love things that are just ‘not right’ and Ripley’s fits that bill. With an odd assortment of world records and deformed human beings, it’s just the thing for 12 year old boys. For us, though, we weren’t that excited. I guess it’s because it has that circus freak feel. Besides, we now know what causes a man to look like he’s 50, even if he’s only 7, or how the tallest man in the world really suffered with joint problem or how Tom Brady got his freakishly big hands (now, I’m not saying he’s an alien, but… ). Personally, I wouldn’t be disappointed if these freak shows were gone forever. So, for this run, we took along reinforcements. Another couple with young kids. No, not a couple we just found by the roadside, another couple from the beach mansion. Family. They had a girl younger than the Youngest, and a boy about his age. In the short time they’d been together, they’d become fast friends. Inside, it was about as I expected, but not quite as the boys expected. 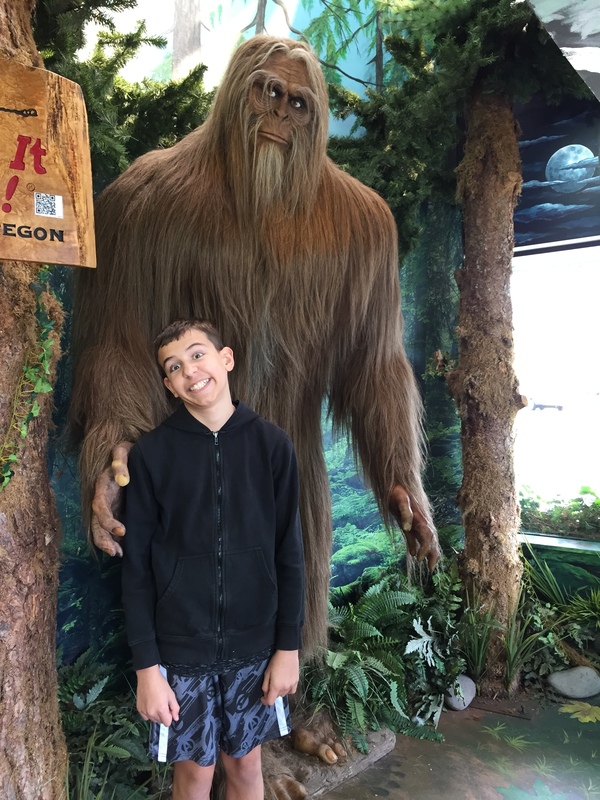 There was a giant sasquatch at the entrance and while the Oldest was happy to get his picture taken with it, the Youngest dragged his mom inside. Not that he was scared, mind you, oh, no, he, ah, you know, just wanted to see what was inside. Like fast! I can’t really blame him. Much of the museum was set up as a house of horrors. With graves, and a spooky pyramid where they had set up mirrors everywhere that would make you jump-scare yourself, it could easily be the stuff of nightmares. Not that I got scared or anything, mind you, oh, no, I, ah, you know, just wanted to see what was in the other parts of the museum. Like fast. 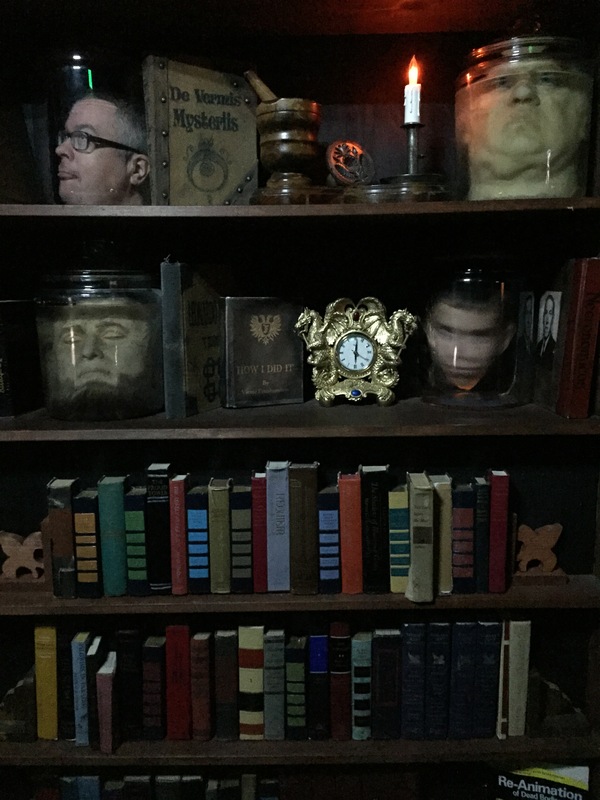 The highlight for me, however, was getting a picture taken of me with my head in a jar. Like someone had cut off my head and stuffed it in there. The Oldest loved that as well. The Youngest refused to look. However, there weren’t many things you could actually touch, which was sad because the boys were dying to touch the shrunken head or the mummy’s bandages. Good museums, like the Fort Langley one, make you realize just how important it is for young hands to feel things. Or nerdy old hands like mine. All in all, there was something for everyone to enjoy. But as one of the family in the mansion said, it’s only something you do when they’re young. Afterwards, both couples and their kids, we all ate at a recommended fish and chips restaurant, and the kids even got a table to themselves. To my amazement, there wasn’t a food fight, no one put ketchup in anyone’s ears, and the owner didn’t come over to our table to ask us to leave. In all honesty, the kids were great. The family that joined us had wonderful kids. It was a pleasure to have them with us, which doesn’t make for good story-telling, but does make for a night where I don’t need to curl up in a fetal position and rock myself to sleep. 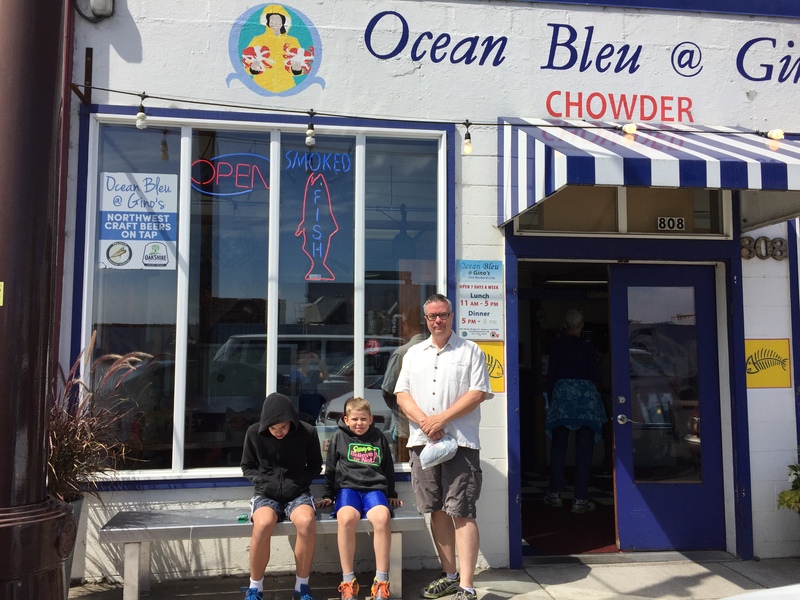 Before we left, we watched the sea-lions croak at us, bought some candy, saved a glass store from the Youngest wanting to touch everything, and wandered around the small seaside town. But the day wasn’t yet done. There was still an epic game of night bocci to come. This entry was posted in Oregon, Parenting, Travel, Traveling with Kids and tagged fish and chips, freaks, horror show, humor, humour, mummy, newport, oregon, parenting, ripley, ripley's, ripley's believe it or not, sea lions, step-dad, stepdad, stepdaddy, stepdaddying, the oldest, the prettiest-girl-in-the-world, the youngest, Traveling with children. Bookmark the permalink.